The ejection seats made by Martin-Baker may be thoroughly modern, but they are flight-tested in two of the oldest military jets still flying. The British company keeps two Gloster Meteors airworthy at its own airfield, Chalgrove, which is not far from the seat production factory at Denham, west of London. The Meteor made its first flight in July 1943 and was used towards the end of the World War Two to intercept German V1 flying bombs. 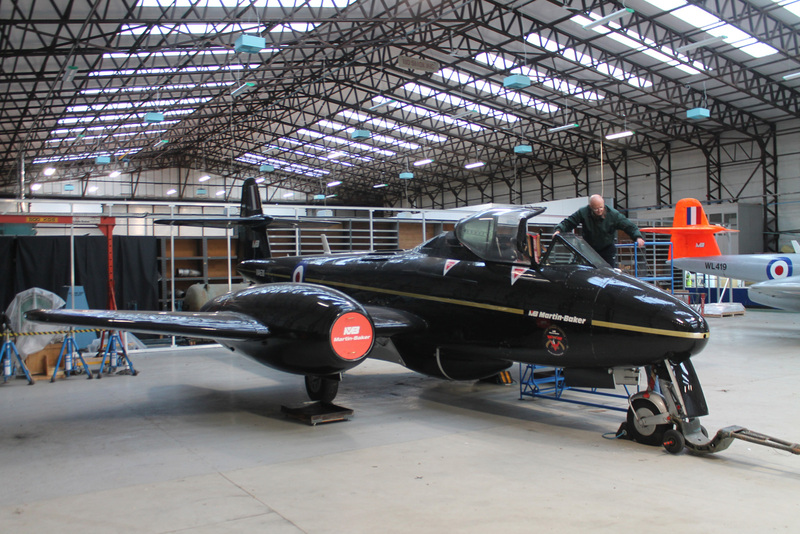 Martin-Baker has been using the type to test ejection seats at Chalgrove since 1946. The pair kept there today have both served the company for over 50 years, and are good for many more years of service. One of them – black-painted WA638 – has used only half of its fatigue life. Before entering service with the company, both of them received structural reinforcements to carry the ejection loads. The ejection seats to be fired, along with the test dummies, are installed in the rear cockpits. Both of these aircraft were built as tandem-seat trainers designated T.7. But they are unofficially described as Mk 7 ½ because they were fitted with larger tails from the Meteor F.8 version. The reason for that, explains Martin-Baker pilot Andy Gent, was the potential for complete loss of elevator control on the T.7 and its predecessor versions if pilots forgot to retract the speed brakes before lowering the flaps and landing gear. Gent is a former Royal Air Force Tornado and Hawk pilot who later flew airliners, and airshow aerobatics. Last year, the two Meteors flew about 25 hours. Since actual test flights usually last only some 20 minutes, the remaining time is clocked on ferry flights, since Chalgrove is no longer used for firings. In 2016, Martin-Baker made four more test ejections of the US16E seat for the F-35 Lightning II stealth fighter seat, flying from Cazaux airbase in France, at altitudes from 15,000 feet to 27,000 feet. The company (Hall 2B Stand F140) has now satisfied the US Air Force that the head and neck injury risk to lightweight pilots if they eject in the US16E has been addressed by two modifications, plus a reduction in the weight of the F-35 pilot helmet. WA638 has done more than 500 ejection seat test flights, and the other Meteor WL419 has done more than 200. Martin-Baker said that WA638 was the oldest flying military-registered jet aircraft in the world. However, both Meteors were transferred to the British civil aircraft register in 2015-16 because, according to Gent, they didn’t ‘fit’ into the UK’s new Military Airworthiness Authority (MAA) regime. “Now, we might actually be able to refit them with Garmin glass cockpits,” Gent joked. WA638 does have some modern instruments, but WL419 still has the 1945-design artificial horizon.